‘Fruit large, oblong, somewhat pyramidal, from three inches and a half to four inches long, and from two inches and a half to three inches in diameter. Eye open, with long segments of the calyx. Stalk two inches long, somewhat obliquely inserted. Skin greenish yellow on the shaded side, with a tinge of brownish red when exposed to the sun. Flesh yellowish white, very juicy and melting, with a peculiarly rich agreeable flavour; round the core it is gritty, and more so, if grafted upon the Quince. Ripe the middle and end of August.’ [George Lindley – Orchard Guide p.341/1831]. ‘Jargonelle is a patriarch among pears, being one of the oldest of all varieties. Its name appears to be derived from Jargon, anciently Gergon, a corruption of Groecum; whence Merlet, writing in 1675, infers that the Jargonelle was the Pyrum Tarentinum of Cato and Columella, the Numidianum Groecum of Pliny, and the Groeculum of Macrobius. So far as we know the earliest mention of the Jargonelle in England is by John Parkinson, who, writing in 1629, mentions sixty-five varieties of pears, among them being the Peare Gergonell. Stephen Switser, who wrote in 1731, also names it. The vitality of the English Jargonelle is remarkable; the trees, it is said, often live for 200 years. In Scotland the variety is cultivated as far north as pears will grow.’ [Pears of New York p.177]. 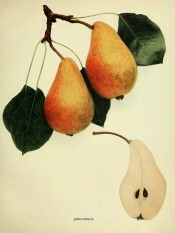 When discussing the French, as opposed to English Jargonelle, Hedrick comments: ‘The name Jargonelle is used in France to denote a group of pears. This fact accounts for the confusion which exists among the names and synonyms of several varieties of this class. The French Jargonelle is said to have originated in Anjou, a former province in France, where it was much cultivated and highly esteemed toward the end of the fifteenth century.’ [Pears of New York p.178]. I assume that Macarthur’s pear is the English Jargonelle. ‘It is one of the finest and best of our early pears.’ Available August [HP pl.XXVI/1878]. Listed in all published catalogues as Jargonelle [Pear no.5/1843]. ‘5. December-January. Valuable for its earliness and very abundant bearer. Must be gathered before maturity like the keeping varieties.’ [Diary B, MP A2951/1862].